Building Custom Solutions with Excel Services This presentation covers the reasons behind Excel Services, the benefits of using them, and a demonstration of using a Web service to incorporate Excel-based business logic into your own server solutions. 'David Berlind wrote this blog "Corporate PCs: Underpowered for Vista. Overpowered for Writely?" and asked if the computing world should be going back to lower powered computers to run Web-based Applications like Google's Writely instead of ramping up their hardware to run Windows Vista. But in my opinion, the question should be reversed since web applications actually eat up more resources than Windows Vista. Google's newly acquired Writely should hardly be considered a replacement for Microsoft Office, Word Perfect, OpenOffice.org Write, or any other rich client. The only Web-based word processor or Office Suite that comes close to something like Microsoft Office is ThinkFree Office which is written in Java. But ThinkFree Office makes resource-hogging OpenOffice.org look good by comparison. Just the word processor alone with no data loaded eats up 100 MBs of RAM. Loading up the spread sheet and presentation software will cost you another 200 MBs of RAM. Oh and if you actually want some data with that, you better prepare a Gigabyte of RAM. Vista on the other hand will run on a computer with 128 MBs of RAM (without any Aero Glass eye candy). Better Image Support - If you want to store images directly in the database the new attachment data-type is a god-send. In the past you would use the OLE Object data type, and because of how OLE worked, there were bloat issues as Access had to store a preview of the file along with the OLE data. Attachments are a new complex data-type that stores multiple attachments to a record in a binary field in a hidden table, and Access compresses the file when it is added if it isn’t already a compressed file type. WYSIWYG Form and Report Authoring - new forms authoring tools allow you to see live data at design time. Working with Layouts - Access 12 introduces a new control-grouping concept called Layouts that provide control flow. Using Layouts, when you move controls around they can snap into position and the other controls can reflow because the controls are all aware of their relationship to one another. Multiple Item Forms - Multi-item forms can be created in one click, and also use Layouts for control positioning. Building a multi-item form creates a datasheet that can be edited, and with a "new item" row at the bottom that can be used to add new records. 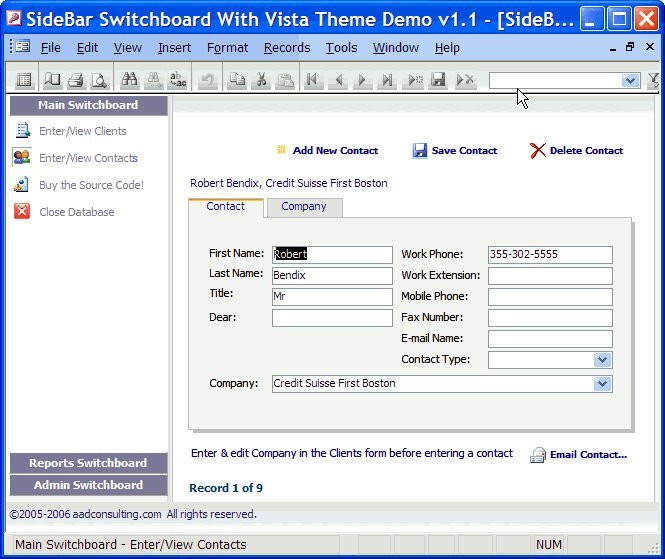 Rich Text In Access Forms - Better late than ever: Access 2003 dropped support for the "unsafe" VB6 RichText Control. Access 12 now provides a native rich text control, and allows users to both display and edit rich text at runtime. Rich text support can be turned on through the property sheet or rich text fields can be added to a form through the Add Field task pane. Sidebar: How about native controls that replace all MS Common Controls, such as the TreeView amd ListItem controls? Color Pickers - More colors that can be set by using the Access theme color picker that is available from the ribbon and builds on color properties in the property sheet. In a Datasheet View, when you want to hide columns, don't select Format > Hide Columns, use Format > Unhide Columns... , as this command opens the Unhide Columns dialog, from which you can dynamically hide/unhide as many as columns as you want, by using the checkboxes for each column. I have just come across, CreateInstall Free, a neat little application for creating Windows install sets, and is particularly suitable for deploying Access applications. 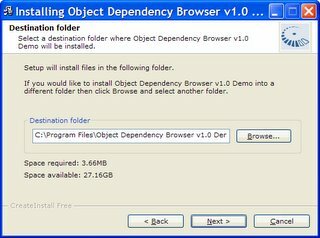 It has a crisp clean interface, is very easy to use, and handles advanced features such as INI files, command-line parameters, and auto-registration of system files, including DLL's and OCX's. SQL Server 2005 Express Edition Absolute Beginners Video Code Samples These are code samples that are a part of the Absolute Beginner Series for SQL Server 2005 Express Edition. Teacher Starter Kit for SQL Server 2005 Express Edition and Visual Basic The Teacher Starter Kit is a rich client application for keeping track of students, course rosters, and assessments or grades. Microsoft SQL Server 2005 Service Pack 1 Community Technology Preview Download the Community Technology Preview releases of SQL Server 2005 Service Pack 1 (SP1) and SQL Server 2005 Books Online SP1 and submit feedback on these releases. Teacher Starter Kit for SQL Server 2005 Express Edition and Visual C# The Teacher Starter Kit is a rich client application for keeping track of students, course rosters, and assessments or grades. SQL Server 2005 Samples and Sample Databases (April 2006) Download over 100 samples and three sample databases for SQL Server 2005. SQL Server 2005 SP1 Download Service Pack 1 for Microsoft SQL Server 2005. Microsoft SQL Server 2005 Express Edition SP1 Microsoft SQL Server 2005 Express Edition is a free, easy-to-use, lightweight version of SQL Server 2005. It is fast and easy to learn, allowing you to quickly develop and deploy dynamic data-driven applications. Feature Pack for SQL Server 2005 Apr 2006 Download the April 2006 Feature Pack for Microsoft SQL Server 2005, a collection of standalone install packages that provide additional value for SQL Server 2005. Microsoft SQL Server 2005 Upgrade Advisor Download the April 2006 version of Microsoft SQL Server 2005 Upgrade Advisor. Upgrade Advisor analyzes instances of SQL Server 7.0 and SQL Server 2000 to help you prepare for upgrades to SQL Server 2005. Microsoft SQL Server Management Studio Express Microsoft SQL Server Management Studio Express (SSMSE) is a free, easy-to-use graphical management tool for managing SQL Server 2005 Express Edition and SQL Server 2005 Express Edition with Advanced Services. Microsoft SQL Server 2005 Express Edition Toolkit Microsoft SQL Server 2005 Express Edition Toolkit provides additional tools and resources for SQL Server 2005 Express Edition and SQL Server 2005 Express Edition with Advanced Services. Microsoft SQL Server 2005 Express Edition with Advanced Services Microsoft SQL Server 2005 Express Edition with Advanced Services is a new, free, easy-to use version of SQL Server Express that includes more features and makes it easier than ever to start developing powerful data-driven applications for web or local desktop development. Dig into the details of SQL Server 2005 Increase security, scalability, and availability with live and on-demand webcasts, along with virtual labs, where you can check out SQL Server 2005 without setup or installation. Migrate Access 2003 Applications to Small Business Accounting 2006 Examine how integration of Small Business Accounting 2006 with Access 2003 can benefit ISVs, particularly the Access developers designing solutions for the small business market. You can receive Access Extra posts as MSN Alerts through your MSN® Messenger or Windows® Messenger, your e-mail, or your mobile device. You can choose how and when to receive messages. MSN Alerts does not charge for sending alerts to your mobile device; however, your mobile service provider may charge for every text message you receive, including alerts. The development flexibility and excellent pricing for the [VB] Express suite contrasted with the higher pricing and relatively aged development capabilities of Microsoft Access suggest that many Access developers will find a more useful environment for creating custom database solutions with the Express suite. I beg to differ. Outside large enterprises, independent Access developers must compete on price, and clients will not pay more for something less accessible and more expensive to build and maintain. Access has been a success because it is simply the best RAD for desktop databases. Visual Studio 2005 Tools for Office Excel Hands-on Labs The labs included in this download provide hands-on practice with developing Microsoft Excel solutions using Visual Studio 2005 Tools for Office.